Everyone should know how to use a computer. I don't mean how to use Microsoft Word, or Adobe Photoshop or some other software package, I mean everyone should be able to have at least a basic idea of what is going on in the box that they spend so much of their lives connected to. But this is not going to happen, no matter how much the major manufacturers try to simplify things, for one major reason. The technical jargon. It's pervasive, inescapable even. Just try to upgrade your computer, or get it fixed, or look for help on the Internet without running into an eye-glazing array of technical terms which mean nothing to the average computer user. Now this would not be such a bad thing if we dealt with our computers the way we deal with our television for example. If it breaks, you fix it or get a new one. The PC market went off on a much different road though. Standards were developed to ensure the modularity of your average PC, so that developers of various technologies could be assured that their devices would inter-connect. Of course, all this standardization has actually made computers more complex. With the television idea, sure you have no idea how it works, but you will never need to. For all intents and purposes, it's a sealed box with a single mission, and if it breaks, it's going to be one of a predictable array of problems, for which fixes and replacements are easily available. A computer, on the other hand, is anything but predictable. It has thousands of different uses, some of which are not even defined yet, and a collection of components designed to interconnect on a basic level, but with no guaranteed compatibility beyond that, mainly because of the array of different uses to which they may be put. Inevitably, you are going to need to troubleshoot some problem over the phone or at a store, and the technician is going to mention some things that you may not have the first clue about. We can help. In this Beginners Guide PCSTATS aims to give you a basic visual acquaintance with the various ports and connectors on your PC, and a general understanding of what they are and how they work, hopefully bridging a circuit between the jargon and your hands-on knowledge of your own computer. Motherboard: The central circuit board that connects all expansion cards, drives and peripherals together. The motherboard houses the processor and the memory of the computer, and contains the buses, the channels which pass data through the computer. 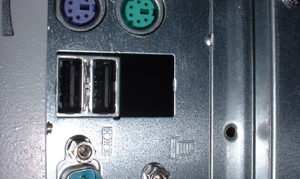 All connections to and from the computer will pass either directly into the motherboard or through an expansion card such as a video-card plugged into the board. 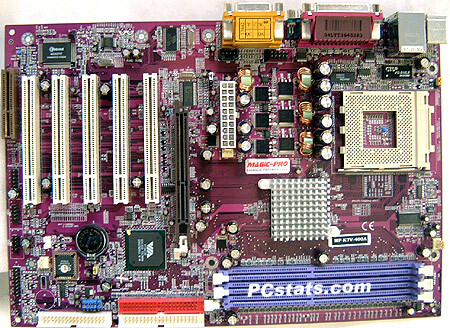 The motherboard provides the infrastructure of the computer. There are many, many available brands and models of motherboard, since each one is designed for a specific range of processors and memory. The chips and circuits that define a motherboard's capabilities are known as the chipset. Generally, chipsets are designed to comply with the specifications of processors as they come onto the market. ATX power supply and case: ATX is the name for the motherboard design, computer casing and power supply standards currently used for home computers. It covers the general form and connectivity of the motherboard, the shape of the case, and the wires used by the power supply. One major difference between ATX and the previous AT standard is in the switching method. AT power supplies had a power button wired to the actual supply, which turned it on directly, regardless of whether or not it was attached to a computer. ATX power supplies feature only a 20-pin power connector to the motherboard, which contains a power-on wire. Essentially, the motherboard controls the power-supply, as long as the power supply is plugged in. 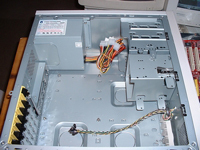 Generally this is done through means of the power button on the case, which connects to the motherboard, but this also enables various other means of powering up the computer, such as wake-on-LAN, which will turn on the computer on a signal from a network card. Obviously, ATX motherboards require ATX compatible cases and power supplies. All modern cases and power supplies are ATX compatible. There are various classes of ATX such as micro-ATX, but these generally deal only with the size of the motherboards and the configuration of cases to accommodate them. 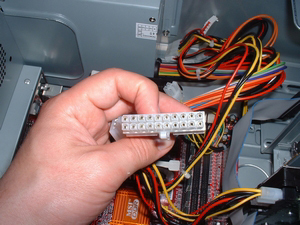 PS/2 connectors: A specialized port for connecting mouse and keyboard devices using a small 6-pin connector. Developed by IBM partly to remove the need to have a spare serial port available for a mouse. 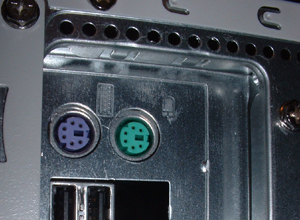 PS/2 ports have been used for keyboards also since the introduction of the ATX specification for cases and motherboards. In general, the computer should be powered off when plugging or unplugging ps/2 devices. The accepted colour coding for PS/2 ports is green for mice and purple for keyboards. Universal Serial Bus (USB) ports: Used for connecting a variety of external devices to the motherboard, USB connectors are hot-pluggable, meaning that you can plug or unplug devices while the computer is powered up, and plug and play (PnP) compatible, meaning that that a PnP compatible operating system will be able to detect and configure new devices attached to the USB port automatically. USB can also provide power for devices through the cable. Because of its flexibility, USB is rapidly replacing many older connection technologies for peripherals, such as PS/2, serial and parallel ports, and it is likely that these legacy ports will soon vanish. Currently there are two standards for USB, 1.1 and 2.0. USB 1.1 is the more common of the two and works with every operating system from Windows 98 on. It is capable of speeds up to 12Mbps. USB 2.0 is the new specification, currently only compatible with Windows 2000/XP, and capable of data transfer speeds of 480Mbps, vastly increasing its usefulness for more demanding applications such as external hard drives and high quality scanners. Technically, all USB devices are compatible with each other and use the same connectors and cabling, though USB 1.1 devices will not gain any speed advantage from connecting to a USB 2.0 connector, and some 2.0 devices will not work at all on a 1.1 plug. Theoretically up to 127 devices can be connected to a USB controller, though this is hardly practical. You can purchase USB hubs that connect to your computer and provide more USB ports for devices.